He writes in the moment, with freedom tempered by insight, offering songs that make you feel and are the essence of feeling themselves. Speak and sing from the heart and the listener will follow. 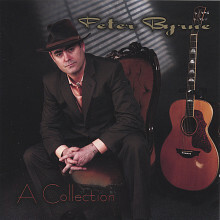 Nowhere is this more true than in the songs of Peter Byrne. "Music has always brought me comfort. I hope mine brings the listener a little comfort too." Music makes him feel, he says, "happy, sad, confused, amazed, perplexed, surprised, mesmerized and inspired ... but most of all, it makes me feel alive!" And truly, Byrne's music is an awakening, a shot to the mind of pure transcendent adrenaline. Feel your consciousness achieve a keen edge at the hands of Byrne's potent songwriting.